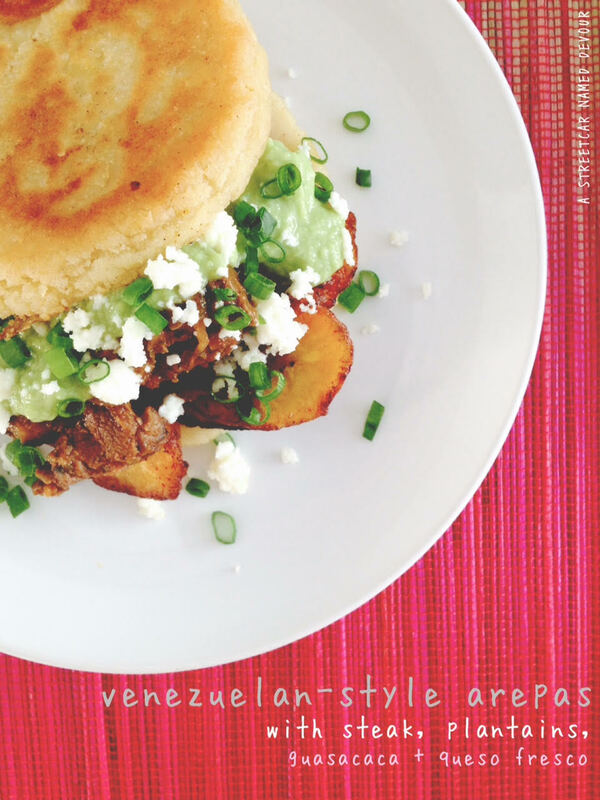 The Venezuelan and Colombian Arepa. Each are comprised of a corn flour-batter mix, shaped into a disc, fried in oil and stuffed with various fillings. While in the past I’ve enjoyed a Gordita or two or 10, and have had quite the experience being a human pupusería, I hadn’t stumbled upon Arepas until my recent trip to San Francisco a few weeks ago. 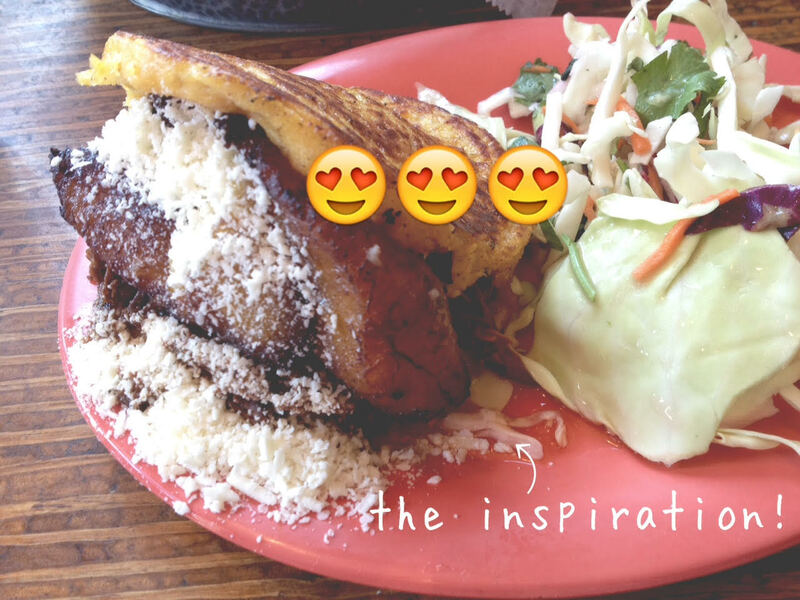 My awesome, longtime friend and hostess Amber, took me to this amazing Venezuelan restaurant in the Mission called Pica Pica Arepa Kitchen. It is FAN (freaking!) TASTIC. 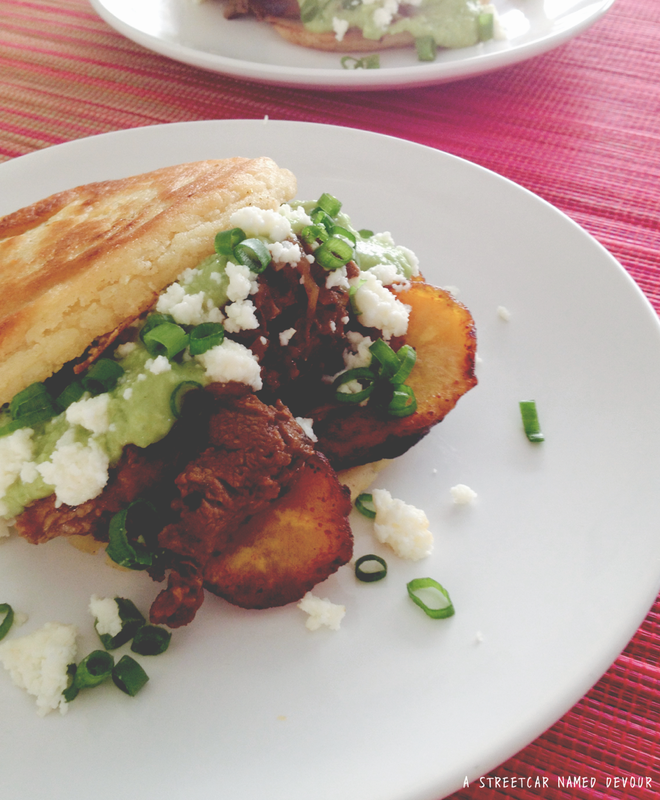 I can’t even begin to describe how delicious the sweet corn, cake-like arepas, filled with hearty shredded beef pabellón, fried plantains, black bean purée and queso fresco were. 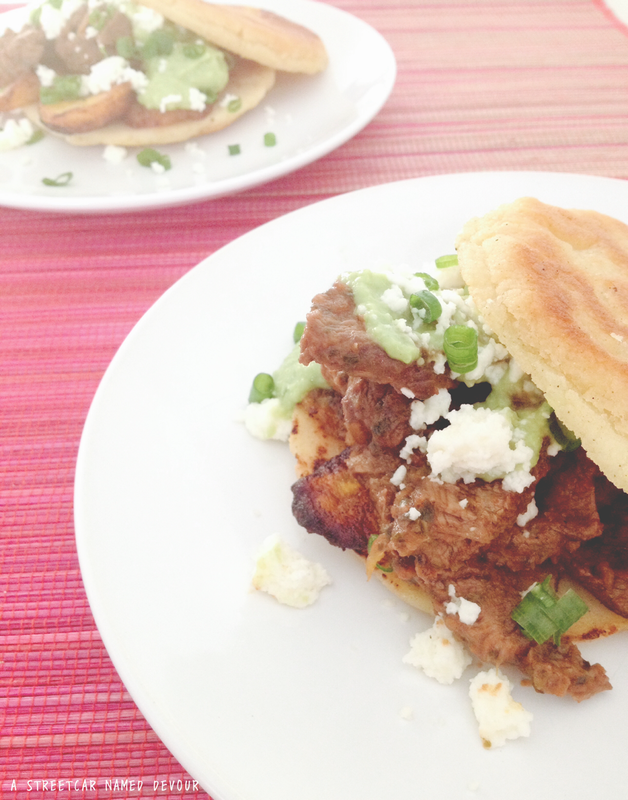 I was in Arepa heaven. If such a heaven exists, I was definitely in it. 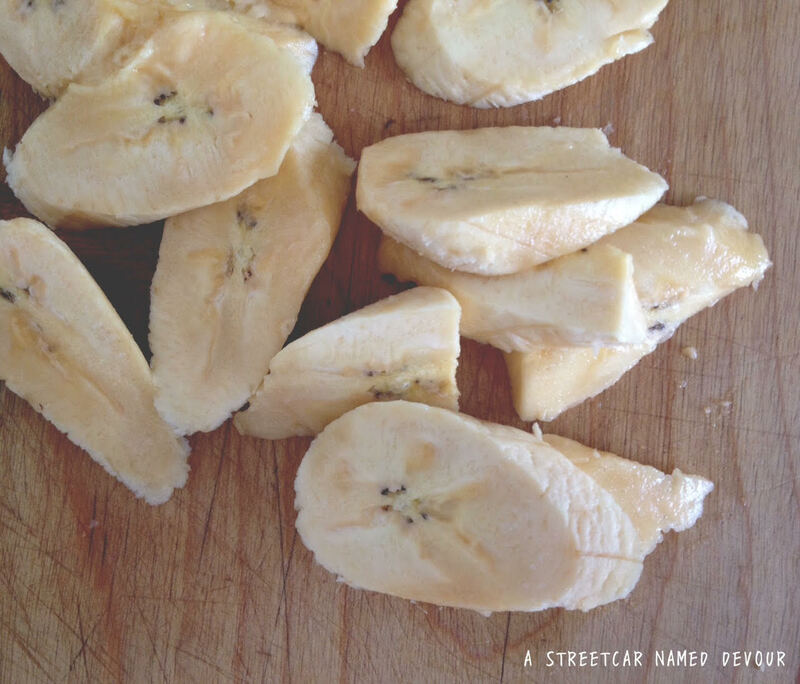 The sweetness of the yellow corn viuda (Spanish for “widow” referring to an unfilled arepa) is most excellent on its own, but when paired with the various fillings, it becomes this flavor explosion in your mouth–the sweetness from the viuda and plantain, the salty from the pabellón and queso fresco and the gentle acidity from the guasacaca. 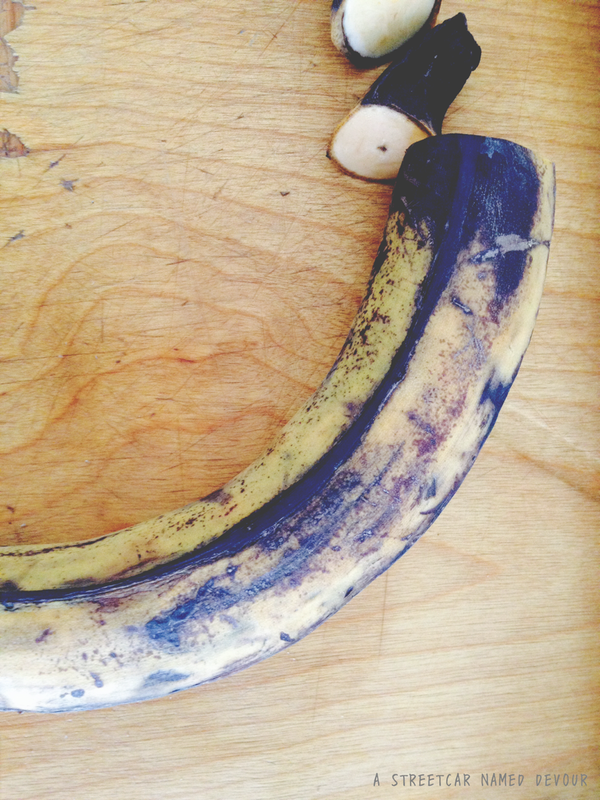 Every inch of your tastebuds are satisfied, wanting more and not knowing when, (or how) to stop. I had long (actually not quite that long, more like a week after) daydreamed of my rather virginal Arepa experience, wanting more. So I made my best attempt at recreating these delicate bellezas del cielo. In a medium-sized bowl add the water, salt and sugar. With a whisk, mix until the salt and sugar is dissolved. Slowly add in the Harina P.A.N. Using your hands, mix the dough, breaking any clumps with your fingers. 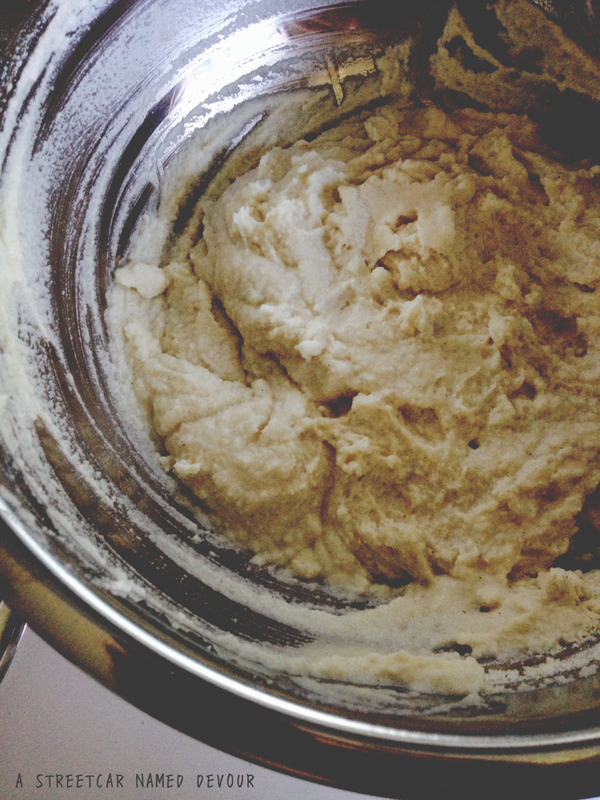 Allow the dough to rest 5 minutes to thicken up. While you’re waiting, heat a non-stick griddle pan or cast-iron skillet over medium heat. Then add the oil to the dough, working the dough with your hands for about a minute. 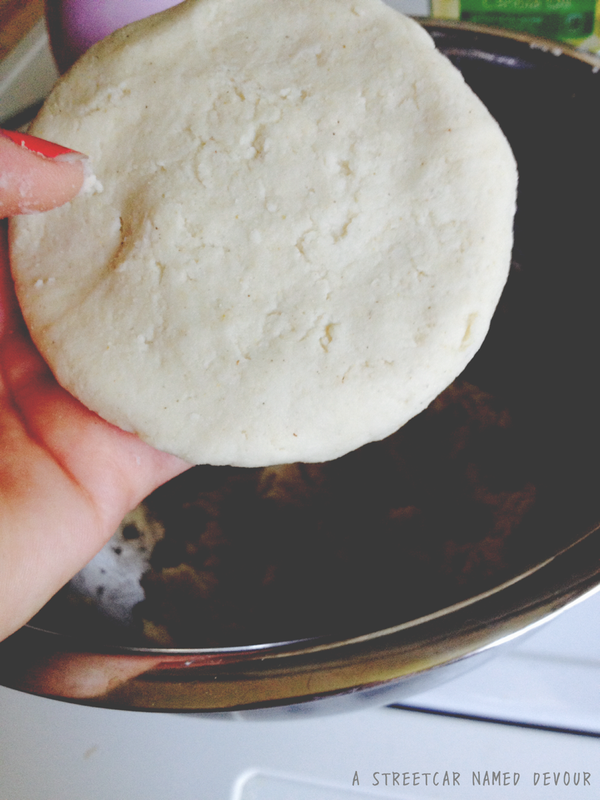 The arepa dough should be firm but not cracking when formed. If the dough is too soft add a little more of Harina P.A.N or more water if it’s too hard. Form dough balls and flatten them gently into discs until they’re about 1/2-inch thick. Immediately place the discs over your preheated pan and cook the arepas for 5-7 minutes on each side or until lightly golden brown. Repeat till all dough has been used. Serve immediately with your choice of fillings. Rub a generous amount of salt and pepper to both sides of your steak. Preheat a large cast-iron skillet over medium heat. Add in the oil, and when the oil begins to slightly haze, add the steak. Cook each side for about 3 minutes, or until lightly browned. When both sides are gently seared, using a pair of tongs, remove the steak and place onto plate to rest. Keeping the heat still on medium, add the onions and sauté till onions are translucent. Then add the tomato sauce, stirring well. Add the oregano and season to taste with salt and pepper. Lower heat to low and allow to simmer for about 20-25 minutes to thicken. While your sauce is simmering, and after resting your steak for at least 15 minutes, slice your steak into even 1/4-inch slices. 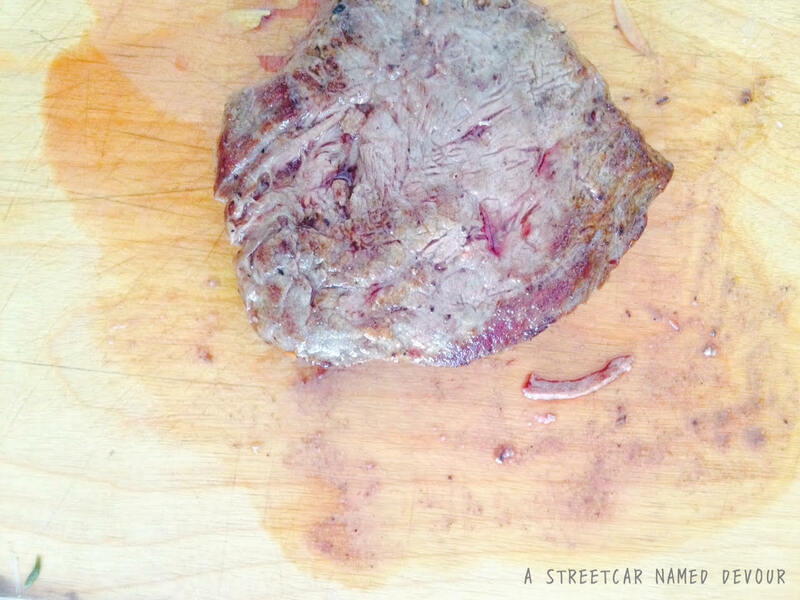 The steak should be at a nice rare pink. When your sauce has thickened up, immediately turn off the heat and throw in the sliced steak. 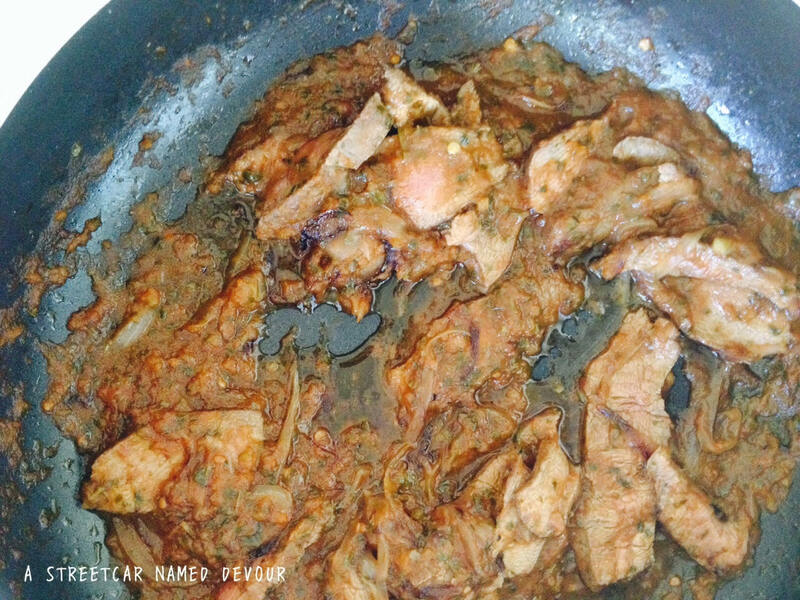 The residual heat of the sauce will further cook the meat just a tad. In another medium-sized non-stick pan or skillet, heat a Tablespoon of oil on medium. 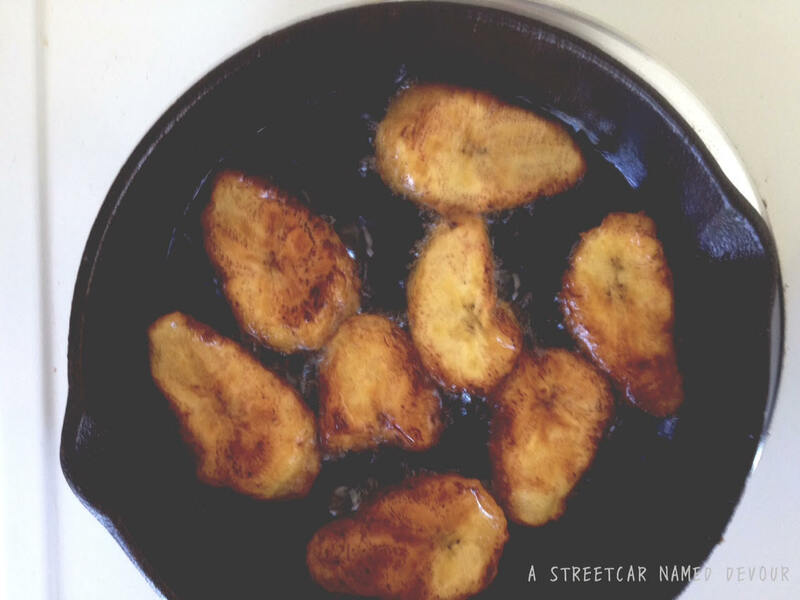 Place the sliced plantains in the skillet, cooking each side for about 3 minutes each or until nicely browned and caramelized. Immediately remove from the pan and into a paper towel-lined plate to absorb excess oil. Next, gather all filling ingredients together. 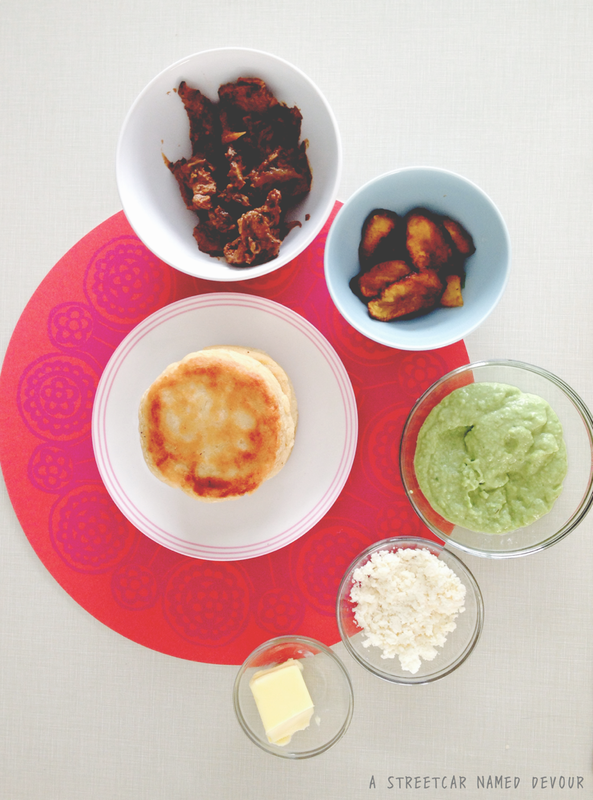 When ready to assemble, split each arepa in half horizontally with a knife. 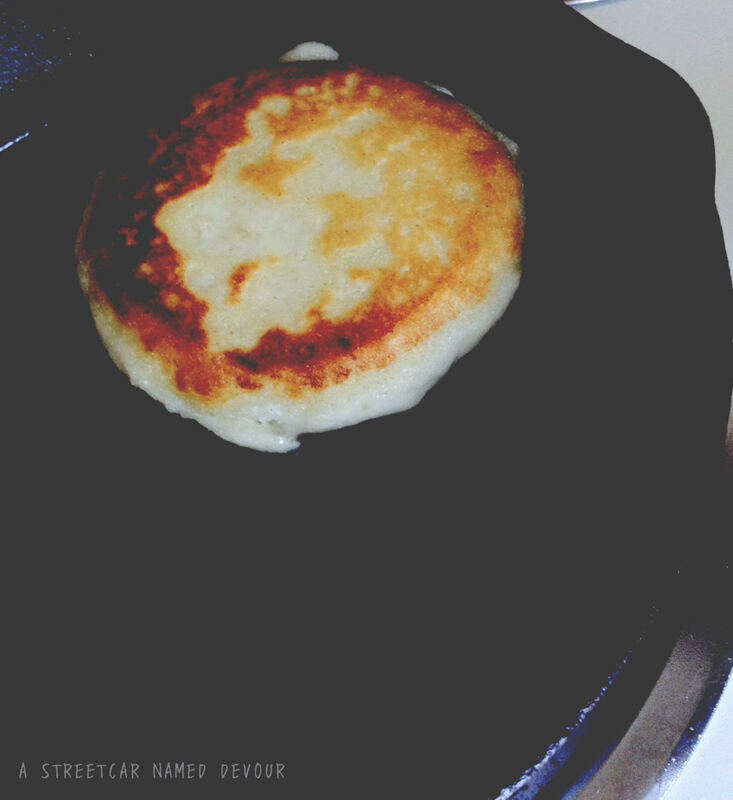 Butter each side of the still-warm arepa. 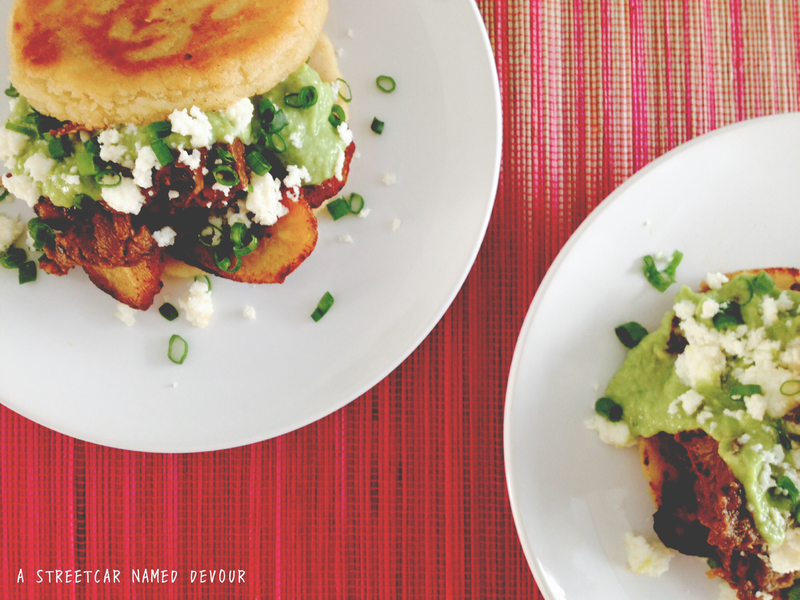 Fill the bottoms of each arepa with the plantains, then layer on the steak, and a heaping spoonful of guasacaca salsa, queso fresco crumbles and green onion garnish.